Sign In or Sign Up at HealthyEssentials.com to get a couple of rebates that could come in handy. Buy $25 worth of Johnson & Johnson products, send in the receipts with the rebate form, and receive a mailer of coupons with savings over $25. Even better, the $25 total is before coupons, so pull out those coupons from the 1/6 Inserts, or print them when you log in to look for the rebate form. 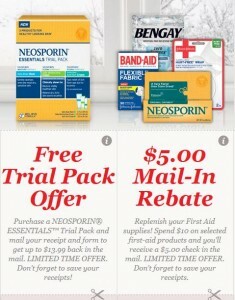 While you are at HealthyEssentials, you can also find a Mail-In Certificate to try Neosporin Essentials Trail Pack for free (up to $13.99). Purchase must be made between 1/6 and 1/13, and they must receive the rebate on or before 2/15/13.